15. Tara tries to dissuade Vali from going to fight. This is the end of the fifteenth chapter Of the book of Kishkinda of the holy Ramayana composed by Valmiki as the first epic. This is the end of the sixteenth chapter Of the book of Kishkinda of the holy Ramayana composed by Valmiki as the first epic. This is the end of the seventeenth chapter Of the book of Kishkinda of the holy Ramayana composed by Valmiki as the first epic. To that lord of monkeys who was like a lusterless Sun , like cloud which has released all its water and like fire which has put out and who was having characters of Dharma and Artha and who was the matchless god of monkeys and who spoke proper words Rama who was criticized replied. This is the end of the eighteenth chapter Of the book of Kishkinda of the holy Ramayana composed by Valmiki as the first epic. This is the end of the nineteenth chapter Of the book of Kishkinda of the holy Ramayana composed by Valmiki as the first epic. This is the end of the twentieth chapter Of the book of Kishkinda of the holy Ramayana composed by Valmiki as the first epic. This is the end of the twenty first chapter Of the book of Kishkinda of the holy Ramayana composed by Valmiki as the first epic. Then all those monkeys and lords of monkeys cried at the death of the very great lord of monkeys. Vali had engaged in a great battle once with a great Gandharwa called Golabha who was greatly valorous and this battle went on for fifteen years , without the battle stopping at night or day. This is the end of the twenty second chapter Of the book of Kishkinda of the holy Ramayana composed by Valmiki as the first epic. This is the end of the twenty third chapter Of the book of Kishkinda of the holy Ramayana composed by Valmiki as the first epic. This is the end of the twenty fourth chapter Of the book of Kishkinda of the holy Ramayana composed by Valmiki as the first epic. Bringing the Palanquin which was got ready along with monkeys who carry it , Tara returned back . Then all of them keeping Angadha in front along with Sugreeva and Angadha offered water to Vali. After setting fire to Vali who was a hero of great prowess who was killed openly by a great arrow of Rama , Sugreeva glowing like a blazing fire approached Rama who was along with Lakshmana. This is the end of the twenty fifth chapter Of the book of Kishkinda of the holy Ramayana composed by Valmiki as the first epic. Then sixteen young and happy girls brought white coloured umbrella decorated with gold, and two Chamaras with golden staff that confers glory. They brought jewels, all kinds of medicinal herbs, sprouts and flowers from juicy trees, white flowers and white clothes, unguents, scented flower garlands from the upland flowers, wonderful lotuses, sandal, scents of different kinds, excellent gold coloured paddy, honey of Priyanga, clarified butter, curds, tiger skin and sandals made of boar skin. These splendid women also brought highly valued unguent musk mixed with red arsenic and came there. This is the end of the twenty sixth chapter Of the book of Kishkinda of the holy Ramayana composed by Valmiki as the first epic. 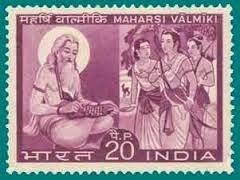 This is the end of the twenty seventh chapter Of the book of Kishkinda of the holy Ramayana composed by Valmiki as the first epic. “The elephants are intoxicated , the great bulls are happy , the king of the forest is taking rest in the forest , the mountain is pretty and the kings do not travel and Lord Indra is playing with the clouds. This is the end of the twenty eighth chapter Of the book of Kishkinda of the holy Ramayana composed by Valmiki as the first epic. “Go along with Angadha and inform the monkeys who have turned old and inform them of my decision and order .After making these arrangements that great monkey lord entered in to his residence . This is the end of the twenty ninth chapter Of the book of Kishkinda of the holy Ramayana composed by Valmiki as the first epic. “The best of elephants in rut with their loud voices are frightening the ducks and Chakravaka birds are found stirring and drinking the water of lakes , which are ornamented by blossomed lotus flowers. This is the end of the thirtieth chapter Of the book of Kishkinda of the holy Ramayana composed by Valmiki as the first epic.